We’re getting rain today for the first time since Hurricane Matthew (32 days!) and the temperature never even reached 50 degrees. And you know what you do on a chilly, rainy Sunday when you have a busted head and a busted foot? 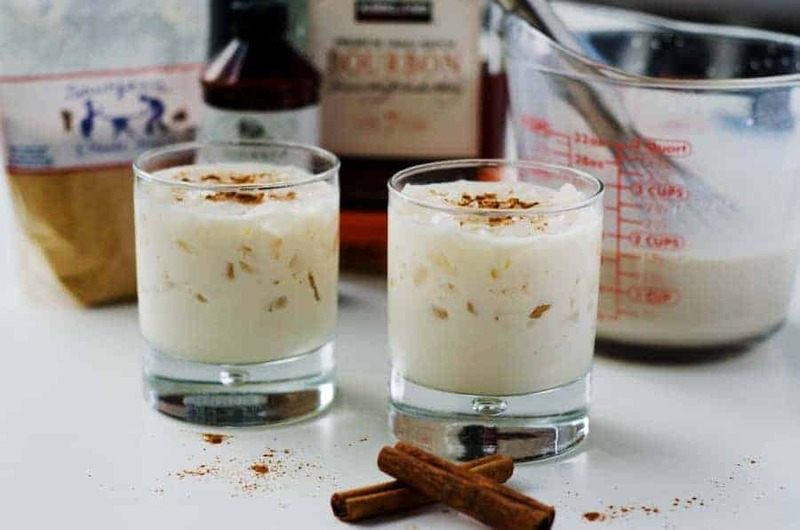 You write blog posts and drink bourbon milk punch, that’s what you do. I took a little tumble at the gym on Thursday while kipping some pullups. And by tumble, I mean I lost my grip on the bar, went flying through the air, and somehow managed to smash both my head and foot on the ground, not necessarily in that order. I thought I was fine, but the next class mentioned that some of my words were coming out a little funny, so I decided to be on the safe side and get it checked out, just in case. I never claimed to be graceful. The catch was, I was going to miss a work meeting for the Divas. So I texted the owner, just to let her know I was going to get checked out and make sure everything was ok, and I was going to miss the meeting. I didn’t call my family, because we didn’t want to make a big deal of it, just wanted to make sure my head was ok. Big mistake. My sister works for the same company, and was on the meeting call. The owner then tells everyone in the meeting that I hit my head and went to the hospital. I mean, yes, technically, that’s what happened…but it sounds a bit more serious when you tell it like that. My sister tried to call both me and Brandan, and neither of us had cell service in the room we were in, so she couldn’t reach us. She then called my mom and dad and asked why I was in the hospital. Needless to say, everything was fine – just a minor little birthday concussion, and what appears to be a sprained big toe. (<– not fun.) We calmed down all the family members and let them know it was nothing a little ice pack and bourbon milk punch couldn’t fix. In other news, Brandan is thrilled to be done with school. I came home the other night and found him on the couch in his pajamas, watching Netflix with the dog. I don’t think I’ve seen him do that in years. It’s awesome. His plan for today was to spend the day on the grill, smoking bacon and making a brisket…ALL DAY. It’s been raining since 8am. Poor guy. 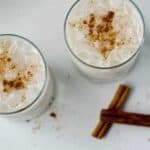 He decided 10am was a bit early to start drinking bourbon, unless he turned it into bourbon milk punch, in which case it was wholly acceptable. We made ours Primal instead of Paleo, using full-fat, grass-fed half and half. If you can’t tolerate dairy, you could most certainly sub almond milk or another dairy-free milk instead. I steer clear of dairy most of the time, but when there’s a flavor compromise (and let’s be real, bourbon isn’t Paleo either!) I’ll make an exception. 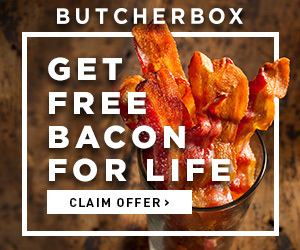 I find that as long as I stick to the grass-fed varieties, and keep it to a minimum, my body handles it ok. Better than, say, flying off a pull up bar and landing on my head. 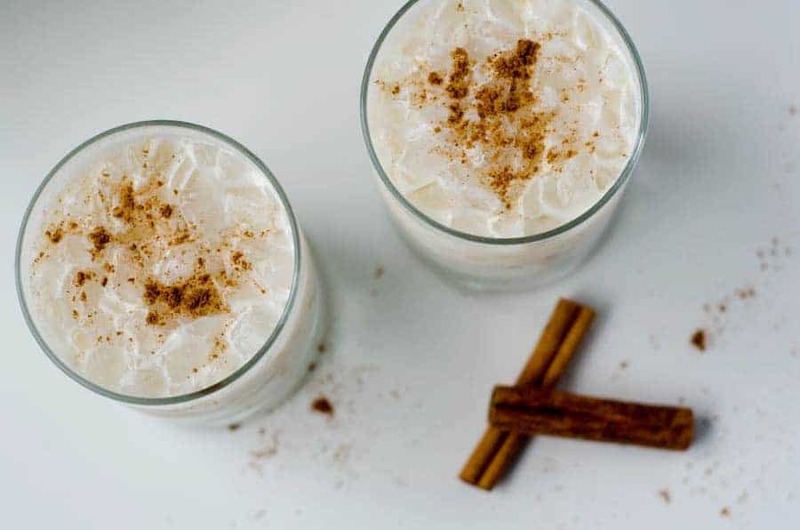 All you need for these is bourbon, half and half, maple sugar, vanilla, and a sprinkle of nutmeg or pumpkin pie spice. We even mix them up in a measuring cup and then just serve them from there – so easy! 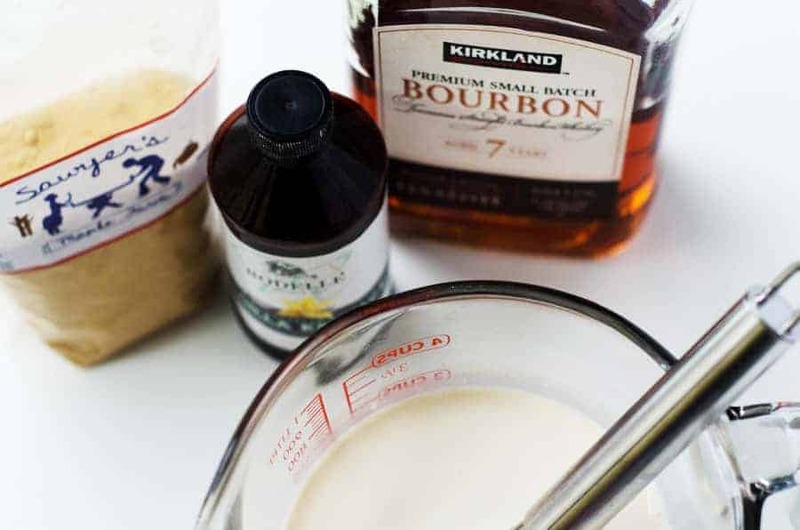 To start, combine your bourbon and half & half (or dairy-free milk, if you’re subbing) and whisk them together. Next just add in your maple sugar and vanilla, and whisk again. Kurt from Sawyer’s Maple Farm in Jackman, Maine sent me a bag of their maple sugar to try out in some recipes, and I used it here. Their maple sugar is very finely ground, so the texture is perfect, and it dissolves immediately, which is exactly what you want. If you don’t have maple sugar on hand, you could definitely sub maple syrup instead. It will change the flavor just a bit, but if you ask me bourbon and maple go together like peas and carrots, so I think any variation of that would be a good one! These are a great holiday treat, and will definitely warm you up from the inside on a cold, rainy day. They’re also perfect as a Sunday brunch cocktail. Enjoy! 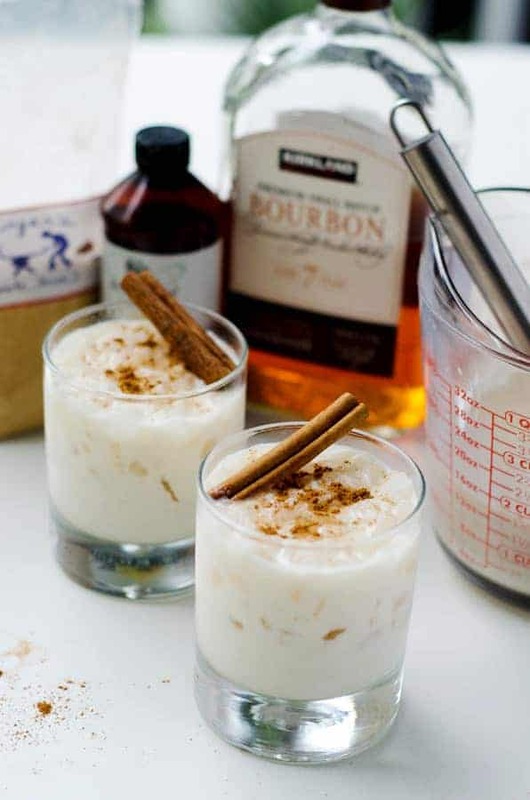 In a large bowl or measuring cup, combine the bourbon and the half and half. Whisk in the maple sugar and vanilla. Pour into glasses over crushed ice. Finish with a sprinkle of pumpkin pie spice or nutmeg and a cinnamon stick and serve. Wow, this looks so delicious! I can’t wait to try this over Thanksgiving with my family!